Sabar’s Tennis elbow supportis ideal for sports injuries and injury prevention. We have a selection ..
provides therapeutic support an warmth, and it is ideal for sports injuries and injury prevention. We have a selection of tennis elbow supports specifically designed to be worn while playing sports, which will help to protect against further sport injuries. The elbow support will help with injuries such as tennis elbow, golfers elbow, bursitis, and tendon relief. For therapeutic and post operative treatments in Arthritis, Sprains, Strains, Tendinitis and Bursitis of Elbow and forearm. Helps relieve pain from muscular overuse caused by work, sports or injury. Ideal for sports and athletic activities and hard work. Provides Compression for weak or over stressed Elbow. Minimizes chance of Elbow injury in sports and other activities. 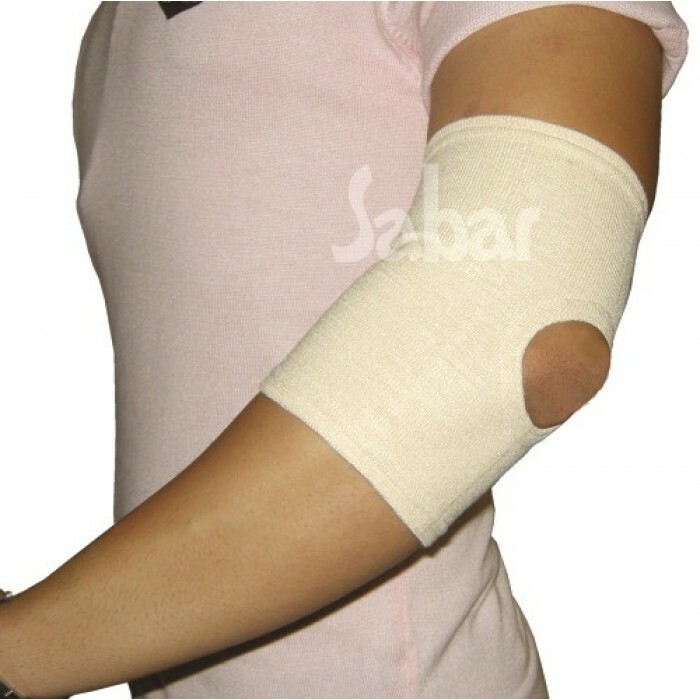 Four way expandable Tubular type Elastic provides mild support to the Elbow. Made from cotton Based surgical elastic, Helps to increases blood circulation by retaining body heat. Sizes : Product is available in S, M, L, XL sizes. Sabar Universal Knee Splint - Knee Immobilizer- provides complete immobilisation when knee is healin..
Sabar Xtra Soft cervical collar (a.k.a Neck collar / Neck brace) is used for supporting the neck and..
Sabar Bio-Magnetic Lumbar belts :Sabar Bio-Magnetic Lumbar Belts are specially designed with fl..
Sabar Back Support - Magneto Backguard 3091XC- back rest - Lumbar Support Seat is an ergonomically c..
Knee Support - Sabar Tabular Knee supportprovides compression for weak or over stressed knees. It mi..
Sabar calf support :adds warmth, compression, and support for calf strains, shin splints, and varico..